Telltale cracked earth of a molehill in a yard. Just when you think you’ve gotten your yard to the pinnacle of neatness, here comes a pesky mole to turn your lawn into a superhighway! Unfortunately, we gardeners are excellent mole-magnets: our tilling, mulching, and watering create a virtual paradise for these burrowing critters who love nothing more than a nice, moist, earthworm-rich hunting ground. 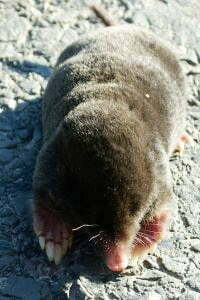 Moles Are Insect Eaters: A typical 5-6 ounce mole can eat as much as 50 pounds of bugs and worms in a year. Among their diet: beetles, earthworms, and lawn-destroying grubs. If you can stand them, they’re excellent natural insectivores. Moles Are Loners: The average acre of land usually supports only 2-3 moles. Moles Are Natural Aerators: Moles live and breed in deep runways and burrows underground, digging upward of 20 feet per hour! Their highway system branches off into surface runways for feeding; these are the telltale “molehills” you see in your yard. While the surface burrows can damage lawns, overall moles are beneficial by aerating, mixing, and loosening the soil. Mole Damage: Contrary to popular opinion, moles don’t eat your plants. However, their surface tunnels can disturb plant roots, which can cause distress. In lawns, molehills make walking and mowing difficult and sometimes damages the grass. And, their tunnels can be hijacked by voles, little mice who DO eat plants. Mole Habitat: Look for mole activity around fences, hedges, buildings, and near woods. Moles Are Year-Round Pest: Moles are active year-round, but they’re particularly busy in spring and fall. During rainy periods, you’ll see more molehills as the earthworms move toward the surface. Trapping can be effective against moles. Unfortunately, moles aren’t easily dealt with. Unless your yard is really showing damage, the best approach is to leave moles alone. They’ll usually move on once they’ve eliminated their food source. You can keep your lawn in shape by flattening the runways with your feet or a lawn roller, or by raking out the tunnels. Determine if Moles Are Active: To test mole activity in your yard, go out and stomp down the existing molehills. Then, watch each day to see if the mole pushes them back up again. Forget Grub Control: The popular wisdom used to be, that to get rid of moles, you must get rid of grubs. That theory’s been pretty much disproven, since moles eat many other insects besides grubs, and if they can’t find food, they tunnel all the more. Trapping Moles: If you really want to get rid of the moles in your yard, the only surefire way is to trap them. Follow trap directions exactly, because improper placement of the trap will doom your efforts! While you can’t control whether or not new moles will move in, trapping lets you know for sure that you’ve eliminated the ones you have. Before you begin, make sure mole trapping is legal in your state. Home Mole Remedies: Human hair, broken glass, mothballs, bleach, thorny branches, car exhaust . . . the list of homemade mole remedies is endless, but the list of results are nonexistent, so save your time and money. Ultrasonic and Vibrating Devices: These clever gizmos are popular marketing ploys, but they don’t work either. Mole Fumigation: Poison gas fumigation is very iffy, because the runways are so extensive and the gases are so easily absorbed in the loose soil or vented to the surface. If you do want to try fumigation, hire a professional exterminator who can do it properly. Mole Poisons: Poisons are also iffy and like fumigants, should be applied by a trained professional to keep you safe. Wormlike baits can work if applied properly. Don’t be fooled by grain-based baits and poison peanuts, moles are insectivores and don’t have the right teeth for gnawing. Shrink Your Lawn: Lawns are the most susceptible to mole damage. If your area is eternally overrun with moles, consider replacing all or part of your lawn with naturalized areas and shrub plantings. Reduce Watering: Overwatering saturates the soil, inviting earthworms and moles to the surface. Cut back on irrigating your lawn, and choose drought-tolerant grasses and plants. Go Native: Native plants are less damage-prone and require less water than imported varieties. Keep Moles Out: Protect your raised beds from moles and other critters by lining them (including the sides) with 1/4″ metal hardware cloth. You can also try a mole barrier around the perimeter of your yard. Hardware cloth or sheet metal should be buried at least two feet deep and should stick up about six inches. Natural Predators: Moles aren’t really a popular predator snack (they apparently don’t taste very good), but your dog or cat might enjoy hunting them or scaring them off. Thanks for sharing your experience with the TodaysHomeowner.com community, Ray! some windmills do work, I’ve had six, three do work well others didn’t. My dad made windmills ofwook and representing an old time logger sawing a log with a reciprocating saw. Those things ratted and shook and they worked.. My brother got those and didn’t share .. ur best was an old Fairbanks single cylinder gas engine that did a thumba ,thumpa bang – mounted on a concrete slab about 6’x 6′ x 8″ deep,. That engine chased moles about 100yards, back out to the fields. unfortunately it was too unwieldy & noisy to use in town.. I can relate to mole problems. I myself have used everything under the sun to rid my yard of these critters. I do find the TOMCAT mole trap the best. It works well caught 9 last year. The trap (looks like a pair of scissors) is a little awkward at first but once you get the hang of it you’ll become a pro. Thanks for the note, Jacqueline. We have removed these outdated links. Been staying with my mom and dad in New jersey and discovered a mole invasion! just one at first ,now several in the back and front yards! tried gas bombs, not safe or easy to use. But this February we got tons of rain and for the first time in many years we found water in the basement! It appears the moles have excavated a lot along the basement walls and allowed lots of water to travel against the wall! We are going to try several methods to get rid of them and water proof the foundation. THE ONLY WAY TO GET RID OF MOLES IS TO HAVE AN OUTSIDE CAT. THEY WILL BE GONE IN WEEKS. My yard was overrun by moles 8 years ago. I tried everything short of car exhaust. When in Lowes one day, I saw Sweeney’s sonic mole and gopher spikes (non-solar). Thought I’d give it a try – nothing to loose. I put one in the middle of 15,000 sq ft backyard. No trees around. Directions said it might take up to 6 weeks to see results. Wow. ..was I amazed. In less than 5 weeks, no more tunnels. As long as I replace batteries annually, I ‘ve been mole free! To be totally honest, I forgot to change batteries one spring and tunnels started appearing. I replaced batteries and within 3-5 weeks no more moles. I have recommended this product (battery powered) to family and friends and we’ve all had fantastic results. Never used the solar units to voice an opinion. I just had to share…Sweeney sonic spikes do work. Don’t know where the go when they leave my yard, but not here! I can affirm that, in my view, mole solar sound emitting repellents do not work as we had one for more than 10 days, and strategically placed them about 40 feet apart. The mole(s) seemed more attracted to it than repelled, and frustrated I got my money back. Gas mole bombs are a waste of money as moles can tunnel up to a 100 feet a day with a labrinth of tunnels that can dilute the toxic fumes. Flooding their active nests or tunnels might be effective but check water restrictions in your area. Killing them with traps seems to be the effective tool, and we’ll try molebuster trap before resorting to another method. They are destructive nuisances that need to be stopped, happy gardening. My lawn was suddenly overrun with moles. I bought some “Tom Cat” worms at Home Depot. The worms were a gel substance with pesticide inside giving the mole a feeling he was eating a worm. Using a screw driver, I made holes on the burrows just large enough to drop the worm pieces in. Cut two worms into four pieces, dropped them down the screwdriver holes in 8 different places and pinched the holes shut. In two days there was no further mole activity anywhere. What a product and I’ve still got 8 more worms in the event more moles move in. So far, so good. I just went up to the moles and ask them to leave or else, they left and I have not seen a mole since. the sonic mole deterrents work! But only until they get used to it. Then they go back to plowing tunnels….took about a month for them to get accustomed to it. We have put crystal moth balls all along the fence where they seem to make their runs. They don’t seem to like the smell and it does deter them.When ever we find a run we dig out the main hole and fill it with moth balls they will not return to that run. Seems to work for now. I wonder if burying a audio speaker capable of low register range, in a water tight plastic “burp” tite container playing some types of thumping “music” might work? My yard has been suffering from mole infestation for months now…I read that combining water, dish detergent and caster oil works as a repellent..Has anyone tried this combination in their yard?? Thanks for the followup, glad to hear it’s working! I tried all the home remedys, such as, wrapping juciy fruit gum around garlic…. (next day found wrappers above ground. tried the hot sauce and pepper mixture ( that just made them dig more….tried electronic sound (they dug them up) tried the windmills (no luck)….tried two different type of traps (didn’t work)….the cat caught one (wife felt sorry for it and let it go)……next stop, gun shop, see if a 12 gauge shotgun will work (Joe Bidden thinks it might) goodbye mole hunters—-happy hunting….. I sure will. Two of my neighbors also purchased one of those critter chasers and they too seemed please with the thus far results. Keeping fingers crossed. Thanks for the update! Let us know if it keeps working as I have moles tearing up my yard, too! Got one of those sonic mole chaser or whatever and so far it seems to be doing the job. have only seen two small holes since putting it in the flower bed in front yard. So will keep my fingers crossed that maybe hopefully no more mole holes. Got the critte chaser at Lowes in Niles. Let us know if it works. Our lawn and garden writer, Julie Day, wrote an article on household sonic repellents for rodents you might want to check out http://www.todayshomeowner.com/do-ultrasonic-electronic-pest-repellents-work/. The consensus was that they didn’t work very well, but I don’t know about the mole version. Glad we could be of help. Let us know what works to get rid of them. Danny, Thanks for the information. I’ve tried most everything but they continue to dig up my front yard flower bed area. They don’t seem to bother the azelia plants but if I plant floweres they die when those little critters tunnel. I’m going to try some of the “hints” you supplied and I thank you ever so much for the quick response. My neighbor also having same problems so I have copied the information you gave me and gave them a copy to read as well. So once again, thanks ever so much.